Fred Williams’s mantle as Australia’s most important landscape painter was first claimed in the late 1960s. The ‘Australian Landscape’ series and ‘Silver and Grey’ paintings from 1969-70 confirmed his place in the upper echelon of Australian art. By 1973 the influential art critic Patrick McCaughey, already a strong supporter, had no hesitation in claiming him as Australia’s ‘most admired painter’.1 Williams had a number of exhibitions in the pipeline and had just been commissioned to produce a series of major new landscapes for the exciting Adelaide Festival theatre development. In the early 1970s Fred Williams travelled far afield for new subjects including Queensland and South Australia. However he also found inspiration within a short distance from his own Melbourne home. Through regular day trips Williams gained valuable perspectives and source material that could be translated into additional and larger paintings back in the studio. Williams considered himself primarily a producer of studio-based pictures: nature was important so long as it didn’t get in the way of his desire to create a ‘good picture’. Paintings conceived in the field were often radically overhauled or alternatively left to sit for many months while he judiciously pondered the next brushstroke or addition. Yellow Gorse, Yan Yean, 1972, belongs to a vivacious group of works produced during this time that took a rather different tack. These were inspired directly by locations on the outskirts of Melbourne which he visited in company with other like-minded artists. As with its companion paintings, there is a great sense of freedom and joie de vivre in Yellow Gorse, Yan Yean. The freshness of colour, exuberant application of paint and immediacy suggests an unfettered approach in which the artist was responding more spontaneously to his surroundings. Painting in the open air took precedence for a while as he took a well-earned ‘break’ from the radically pared down minimalism and expansive colour-fields of the ‘Australian Landscapes’. Yan Yean, 36 kilometres north east of Melbourne, was originally known as Ryder’s Swamp. It was a natural basin to the east of the Plenty River that was dammed in 1853 to supply fresh water to a growing city. The picnic grounds became a popular spot for excursionists. Cool breezes in summer and picturesque views across the water through to Mount Disappointment made it an idyllic place to visit. Photographs taken by Anne Hall and Michael Ingleton depicting the two artists working at their easels provide an insightful glimpse into their respective demeanour and approach. Perceval sits hunched on a stool, close to his painting. Invariably the canvas was placed on the ground and propped up by a stick or rested against the back of a log. The paraphernalia of his craft casually surrounds him and a brush is rarely out of his hand. Williams, in contrast, some ten or so metres away, shields his work from prying eyes including that of the camera. The work is elevated and Williams stands a metre or so back from the canvas as he contemplates the outcome of his work. This photograph captures Williams in a moment of assessment and self-criticism, in contrast to Perceval’s ‘can-do’ approach. Williams holds a cloth in readiness to rub back any unwanted areas of impasto. Characteristically, Williams also turned his back on the popular view of the dam and surrounding mountains favoured by amateur artists and photographers. In the remaining vestiges of low-lying swamp, sharp inclines of the hills and the tripartite division of foreground, incline and sky, he found more than enough of interest in subjects that were neither picturesque nor pretty in a conventional sense. Yan Yean Swamp 1 and Yellow Gorse, Yan Yean are similarly scaled companion pictures. In the first of these, Williams uses a portrait canvas to create a visual tension between the vertical perspective and strongly delineated horizontal bands. The tension is released ever so slightly by the device of showing the horizon line at a slight diagonal angle to the picture plane and the dabs of coloured foliage that are suspended in the sky. In Yellow Gorse, Yan Yean Williams breaks away from the more firmly articulated divisions by creating a dense thicket that obscures the suggestion of lineal separation. Moreover, the broad sweep of the foreground, which leads to a central location up the hill, punctures the flat surface plane of the preceding picture creating a greater sense of pictorial depth. In these formal approaches Williams demonstrated his interest in making pictures that took inspiration from the landscape but were designed ultimately to stand on their own merits. Similarly in his use and experimentation with colour Williams showed his analytical mind in which colour performed a particular role. With the Yan Yean series, and works from the period produced at various coastal locations, Williams began to experiment more freely with colour and with widening the breadth of his palette. Williams had previously made use of colour wheels or charts to help guide his choice and placement of colour. Some of these were based on the famous 19th century colour treatise by M. E. Chevreul in which he outlined that certain colours produced specific effects when placed next to each other. Aspects of Williams’s newly devised colour palette are clearly visible in Yellow Gorse, Yan Yean. 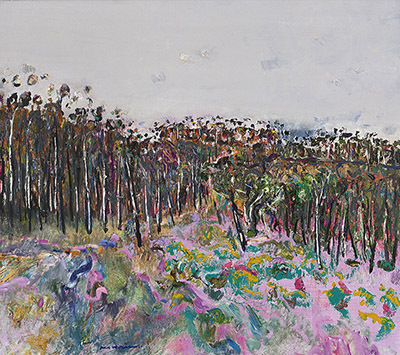 In the foreground, bright and expressive daubs of bright yellows, mauve, blue, green and pink bounce jovially off each other and across the surface. The outlining of the white tree trunk in heavy black lines adds another layer of complexity to the colour contrasts, while in the sky white and dark grey forms emerge from a monochrome grey-blue base. The painting is a wonderful experiment with colour contrast and the expressive application of paint. Williams intended one of the Yan Yean works to become a centrepiece in his Adelaide Festival theatre ensemble. This did not eventuate but, reflecting upon the importance of his landscape paintings produced over 1972 and 1973, Williams recognised how valuable the works were in reorientating his practice after a protracted period of studio-based work. The experimentations with colour and form and the freer application of paint had a liberating and long-lasting effect on the artist.